Toyota and Mazda handed Alabama the $1.6 billion auto factory prize in mid-January, choosing a Limestone County industrial megasite for an operation expected to employ about 4, 000 people building Corollas and a new small SUV from Mazda. The site had been looked at before by automakers — it was passed up some years back by Volkswagen — but this time Huntsville was ready, according Mayor Tommy Battle. Gov. 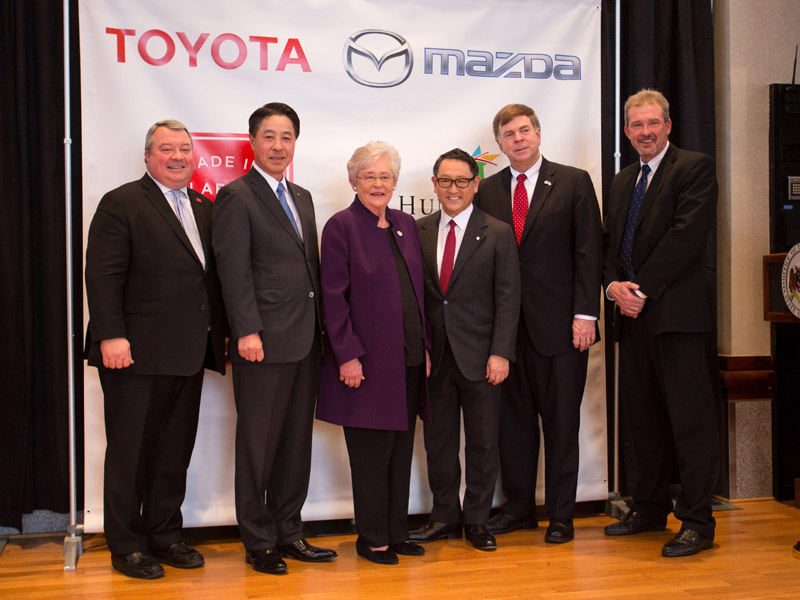 Kay Ivey made the official announcement Jan. 10 in Montgomery, flanked by Akio Toyoda, president of Toyota Motor Corp., and Masamichi Kogai, president and CEO of Mazda Motor Corp. It wasn’t the Toyota CEO’s first visit to Alabama — he noted his first extended stay in the States occurred some years back as a visiting Boy Scout. The plant, first discussed publicly by the two automakers last August and code named Project New World, drew a long line of suitors. Alabama’s strong automotive supply lines, Huntsville’s megasite and trained workers eager to make $50, 000 a year yielded the winning bid. North Carolina, reported to be Alabama’s only competition for the plant in the last stage, offered a whopping $1.5 billion in incentives, according to the Raleigh News & Observer. The paper said leaders in that state were confident enough that they had readied a bill for the Legislature to approve the package. Alabama’s incentives package was estimated at as much as $900 million, counting state and local incentives, which were still being sorted out by Alabama Secretary of Commerce Greg Canfield and others. 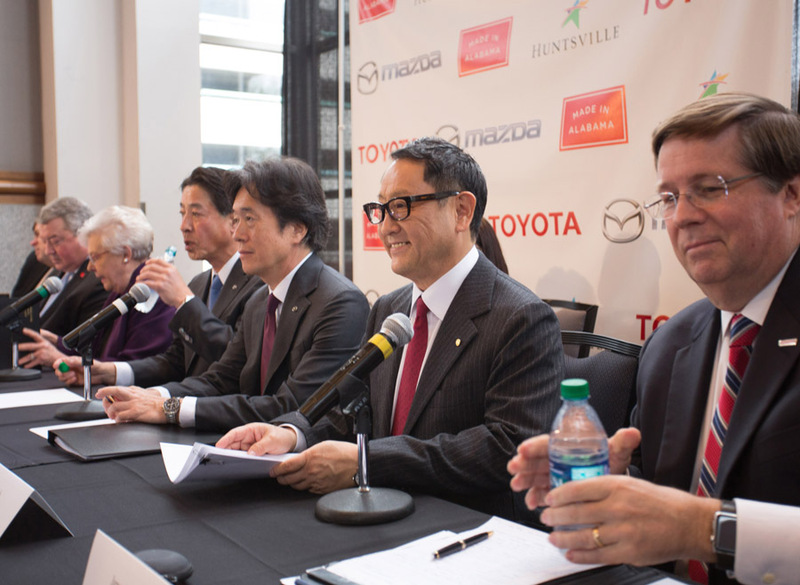 ABOVE Toyota and Mazda officials came calling Jan. 10 in Montgomery with their big news. The plant should begin operations by 2021 and have an estimated annual production capacity of approximately 300,000 units. Toyota and Mazda already have a solid record of cooperation. Toyota makes hybrid technology like that found in its Prius for Mazda, which in turn makes compact cars for Toyota in Mexico. Such compacts saw a nearly 10 percent drop in sales in 2017, according to Autodata Corp., meaning that the new factory’s model output may need to change before it gears up. The two companies have said they will split the development cost of the new plant equally. An agreement signed last August also indicated the new plant would be a collaboration site for further work on green technologies, connected-car technologies and passenger safety. Among about $320 million in auto plant incentives, Huntsville is donating the land for the plant to Mazda-Toyota, estimated to be a $68 million value. “Nothing would please me more than if, through this alliance, we can help to energize the auto industry and create more car fans by bringing together two competitive spirits to spur each other on, ” said Mazda’s Kogai.